Golden Horn in Istanbul is a natural waterway which flows into Istanbul's Bosphorus Strait and makes the historical Old Town (Fatih district with Sultanahmet neighborhood) a peninsula. The shores of 7.5 kilometers (4.66 miless) have many things to do and see. Rich history makes this area a popular attraction for tourists and artists. Historians assume that definition of Golden Horn comes from how the waterway looks - a narrow inlet is split into two smaller streams. When looked from high above it does remind of a horn. The word golden is probably referred to the goldish color the water seemingly acquires at the sunset. Another guess of the root of "golden" is the wealthy trade area of Istanbul that this place once was. Greek geographer and historian Strabo who lived on the territory of modern Turkey called the bay "Golden Byzantium". Later Greeks referred to it as the Golden Horn. Today, however, the Greeks have a name which is equivalent to "gulf in the form of a horn". Germans say Goldenes Horn. Italians - Corno d'Oro. French - Corne d'Or. Spanish - Cuerno de Oro. Turks use simple "Halic" which from Arabaic translates as "gulf" to refer to the popular area in Istanbul. Golden Horn provided sanctuary for ships for many centuries. The natural harbor is 35 meters (115 ft) deep. Roman, Byzantine and Ottoman governments used the waterway as a safe harbor. To make it even more safe a gigantic metal chain stretching from the entrance in the north to the Tower of Galata (now distroyed, new Galata Tower replaced it) was used to protect the harbor. No foreign ships could enter and impose danger. The area has been always well inhabited. Early settlers date back to 7th century BCE. Jews have lived in Balat since Byzantine times. Ethnic Greeks settled in Fener neighborhood in the 15th century. More Jewish, Armenian and Georgian settlers moved here during Ottoman times. Today the banks of the bay host the Istanbul Chamber of Commerce, museums, cemeteries for Muslims, Greeks and Jews, Halic University. Today four functioning bridges connect the Fatih peninsula with the rest of European Istanbul. There used to be five bridges in the past, one of which is no longer in use. Halic Bridge connects Ayvansaray and Halicioglu neighborhoods. It is a 10-lane motorway bridge which lets passengers travel easily all the way to the Asian side through 0-1 highway and over the Bosphorus Bridge. The Halic Bridge was built in 1974 with partnership of Turkish Ministry of Transport and foreign (Japanese and German) counterparts. It took 34 months to complete the project. Ataturk Bridge connects Unkapani Kucukpazar (Fatih district) and Azapkapi (Beyoglu district). The name of the bridge comes after the founder of Turkish Republic Mustafa Kemal Ataturk. The Ataturk Bridge had four rebuilts and various names since the first construction in 1836 . The most known name of the bridge is Unkapani which is still used as an alternative to Ataturk. Golden Horn Metro Bridge is the newest of all bridges. It is located right next to the Ataturk Bridge and, as the name suggests, was built as part of a metro-extension project. M2 line on Istanbul metro map goes over this bridge. This is a unique cable-stayed bridge where cables support the bridge deck. Unlike other bridges, this one has a wide side walk on both sides and offers a great unique view of Istanbul. Galata Bridge is the most known and mostly visited bridge by tourists, artists, film-makers. A bridge in this area was first built in as early as 6th century by Justinian the Great. The construction had been rebuilt 5 times since then. The bridge connects Eminonu and Karakoy neighborhoods in Istanbul. The current bridge was built in 1994 and renovated in 2003. 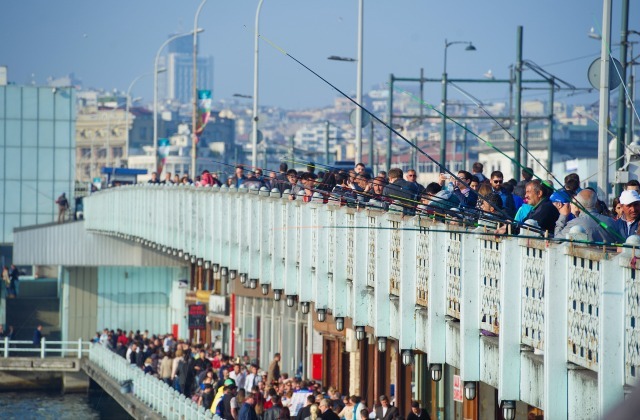 Some joke that the Galata Bridge was built especially for fishermen to catch the fish. Today the place has numerous fast food fish eateries around. Most eaten meal is the fresh grilled mackerel sandwich. The most common view is the fishermen catching the fish. Pierre Loti, a French poet, lived in a house overlooking the famous inlet. Depending on the location of your hotel, the view of the water from your hotel windows maybe the Halic and not the Bosphorus or Sea of Marmara. Pierre Loti hill in Istanbul has the best view of the gulf and its connection to the Bosphorus Strait from the bird's eye. See for yourself whether the water does seem golden in the evenings and the waterway's shape reminds you of a horn. Ataturk Bridge is best for evening view of the area from the bridge level. 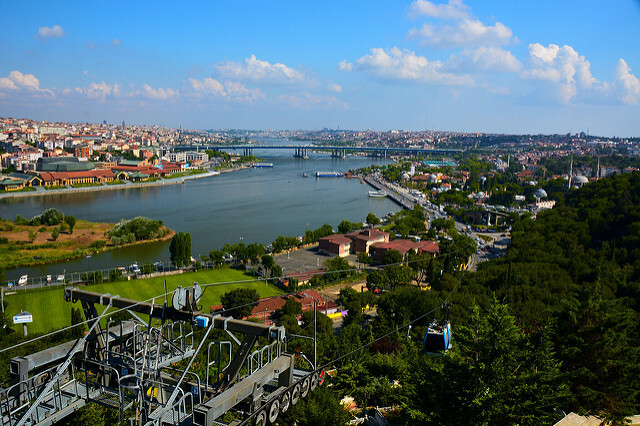 Golden Horn Metro Bridge's initially projected 82 meters (269 ft) of cable heights potentially violated cultural criteria of World Heritage Programme. To stay on the list of UNESCO World Heritage Sites the height of the cables was lowered to 47 meters (154 feet). Mackerel sandwiches widely sold under and around the Galata Bridge in Istanbul may have questionable freshness in the high-heat months of July and August. As much as the sellers claim that the fish served to you was caught an hour ago, use your common sense and intuition when buying this famous snack in Istanbul. During excavations for the Golden Horn Metro Bridge a Byzantine-era artifacts were found - proof of ancient ports, ships, facilities. The findings put off the completion of the metro line for many months and required redesign in the project. In 1502 Ottoman Sultan Bayezid II rejected Leonardo da Vinci's design of a first bridge over the natural bay for unknown reasons. The great Italian's geometrical principles were used in 2001 in the town of As, Norway. Stay in a hotel with the view of the Golden Horn in Istanbul. There are many to choose from, yet the ones below are top choice of most travelers. The area is close to major tourist attractions, calm and off the street noise and has friendly prices. You will be in the heart of Istanbul's history and have access to everything you need for a comfortable stay on your Istanbul trip.